Two pens. A plastic sword. A robot. A piece of paper. A tiny, round shield. 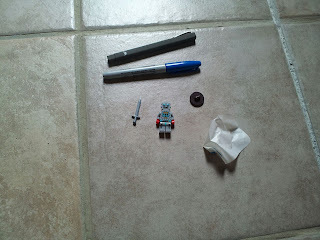 That could have been stuff in a little boy's pockets in the 1960s, although the robot might have been a soldier. In the 1920s, the pens would have been pencils. Otherwise, not much has changed in a century. The world might be totally, unfathomably different, but little boys still leave the same things in their pockets.